NH90 NFH and NH90 TTH helicopters are displayed at the ILA 2012 Berlin Air Show. NHI is proud to announce that two NH90 helicopters are displayed at ILA Berlin Airshow between Sept 11th and 16t th. One in Naval configuration (NFH) and the other in Tactical Transport configuration (TTH). The helicopter, displayed on EADS static area and in flight is an Italian NH90 NFH ordered by the Italian navy. The NH90 NFH is the most recent and most flexible helicopter for naval warfare, it is designed according to precise NATO Staff Requirements,it is equipped with a state of the art weapon system combining on a modern platform several types of sensors with a complete weapon suite. The NH90 NFH is able to perform a wide range of missions such as Anti-Submarine Warfare, Anti- Surface Warfare, SAR, Transport, Special Ops support, Boarding Party, Maritime reconnaissance and Anti-Piracy in any type of environment. The German Armed Forces will display the Tactical Transport Version of the helicopter, the NH90 TTH configured with a complete medical care suite. 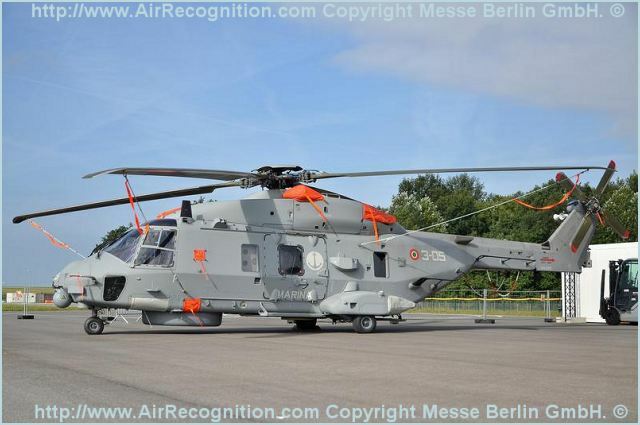 The German Forces received 25 NH90 out of the 122 ordered. The NH90 TTH is able to perform a variety of mission from Troop and Logistic TransportSAR and C-SAR, Casualty and Medical Evacuation, Specila Operations, Parachuting, Utility. “We are very proud to display the NH90 in Berlin since Germany is one of the founding nations of this outstanding helicopter “declares Xavier Poupardin, Delegated Managing Director of Nhindustries. The NH90 is the optimal choice for tactical transport, naval, operations and medical evacuation thanks to its large full composite airframe, its excellent power to weight ratio; and its wide range of rôle equipment . It features a redundant Fly-by-Wire flight control system for reduced Pilot’s workload and enhanced flight characteristics. As of today, more than 119 helicopters, out of 529 ordered, have been delivered and are in service in Germany, France, Italy, The Netherlands, Sweden, Finland, Norway, Greece, Oman, Australia and New Zealand. The final assembly lines have been optimised in order to ramp up the delivery rate. The twin-engine, medium-size NH90 helicopter program is managed by the consortium NHIndustries, the Company owned by AgustaWestland SpA (32%), Eurocopter (62.5%), and Stork Fokker (5.5%).